METAL-READYTM provides the best adhesion for POR-15® on any surface, including aluminum and shiny polished metal surfaces. Our simple process gently etches metal, creating an ideal anchor pattern for coatings such asPOR-15®, while simultaneously leaving a zinc phosphate coating to insure chemical bonding of paint and steel. Avoid other preps that may leave harmful residues which prevent proper adhesion. After thoroughly degreasing your work piece, apply environmentally safeMETAL-READYTM to both neutralize any rust and etch any clean bare metal. This will allow better adhesion ofPOR-15® or any other paint. 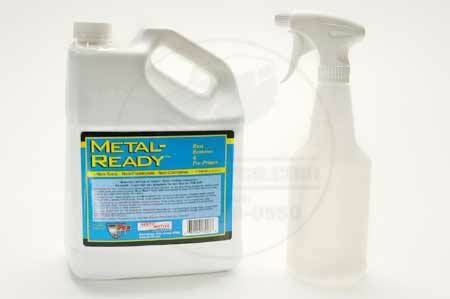 METAL-READYTM is not caustic, corrosive, toxic or flammable.